“War did not destroy our society because of our leader’s determination to establish and foster a law and order system for our nation. Our leader is not only a great military strategist. He wants to develop Tamil society into a great modern nation which upholds the high values of civilization and culture. The Sri Lankan law and order system was the main instrument with which Sinhala chauvinists oppressed and destroyed our society. So our people despised it. Hence our leader said that our law and order system should be designed with a view to avoiding the injustices which were inherent to Sri Lankan law and legal institutions. He said that the Tamil Eelam law and order system should be considered by our people as their own; as one rooted in our traditions and values”, Mr. Thamilchelvan said. “You all should work with utmost dedication and uphold the Rule of Law. Look at what’s happening in Sri Lanka. We see that there is corruption among some judicial officers in Sri Lanka”, he added addressing the graduates of the Law College. Today we are strong in many ways. It is because our struggle is just. We are not war mongers. We are determined to try our utmost to achieve our aspirations by peaceful means. Sinhala chauvinists consider the peace process as an opportunity to undermine Tamil society. In the past they showed one face to the international community and another to the Tamils. Today they stand exposed”, Mr. Thamilchelvan said. “The Thamil Eelam Law College was established at Chunnakam (in Jaffna) in 1993 to uphold the Rule of Law, fundamental rights and human rights and respect for human values. We have over the years won the confidence and trust of our people with the expeditious and equitable processes of our judicial system. 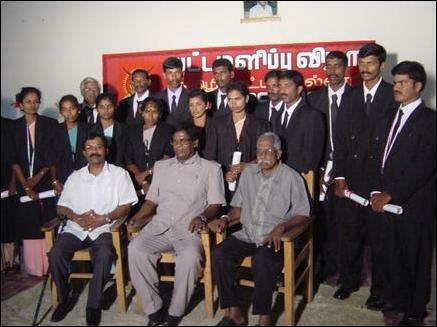 Of the Until 31 December 2003, 30484 cases were filed in Tamil Eelam courts. 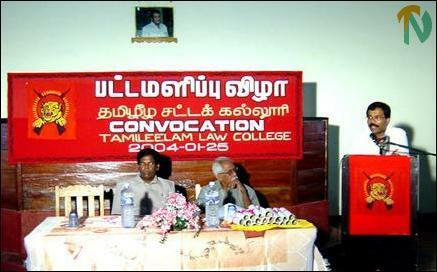 Judgements were delivered on 23322 cases”, said Mr. E. Pararajasingham, head of the Tamil Eelam Judiciary and President of the Tamil Eelam Law College in his address at the convocation.